As of last month, we’ve been married for five years. It may not be much, but it's an impressive feat for us nonetheless: we’ve survived a transatlantic move, grad school (probably harder on the partner than it was on the attendee), combining apartments and moving houses, trips to more countries than I can count, and one really weird raging fever virus that put me down so hard I missed a week and a half of work. Our five years has included an awful lot of costumes, parties, starting new jobs, applying for visas, eating amazing food, doing dumb things to make the other one laugh, and most of all, some insanely delicious meals. …And also some pretty rough ones. We can’t be perfect all the time, in the kitchen or in life. So to celebrate, I did what I always do: I made a cake. This year's anniversary didn't look quite the same as anniversaries of years past: there was the year we escaped to a cabin in the mountains where it started snowing just as soon as we climbed in the hot tub; the year we visited thousand-year-old churches in Durham, England; the year we hung out poolside on a Spanish island off the coast of Africa... and then there was this year, where our passports were stuck at border patrol because we had to renew them because we both filled ours at the same time. We were stuck in Edinburgh, but we made the best of it with a fancy dinner for two and a giant slab of this cake for each of us. And honestly, it's been a long time since I've been as proud of a thing I baked as I am of this cake. Not only did I not have access to yellow cake mix, but I also didn't have any Jell-O mix of the appropriate flavour- and I can't find a shop that sells it here, so there was a lot of making do on this recipe. A lot of times during the process when I thought 'Now I've definitely ruined it,' but I kept on going and wouldn't you know it? The cake surprised me after all. So in honour of the last five years, the good, the bad and the wonderful that came along with it, and the most challenging US-UK baking conversion I've had to date, here's the recipe for the moistest, most delicious strawberry cake I've ever tasted. From Mrs. Coderre to Mary Marx to me and now to you, I recommend you make this ASAP while strawberries are still in season and ready to be picked... even without the icing, this cake is worth it. If you're stateside, I recommend following the directions as printed in the photo of the recipe, because I have no idea how to compare the 'jelly'* I used to what you can get in the US. ** If you're not into frosting, you can totally leave it off and this cake wouldn't suffer for it- yes, it's that good- but feel free to swap the frosting for barely-sweetened fresh whipped cream instead. After you add the strawberries to the batter, the mixture will look thin and curdled, but don't fret- it will all come together in the end! *Note that 'jelly' in this recipe refers to the UK form of jelly, which in the US would be gelatin or Jell-O. 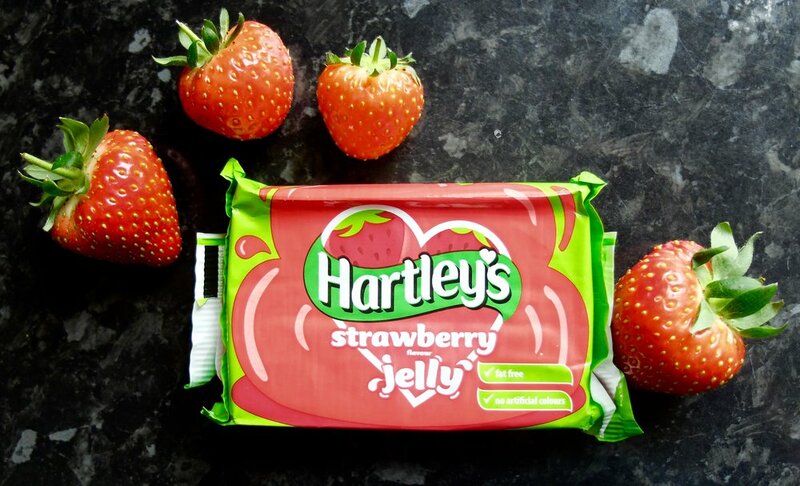 **Jell-O brand isn't widely available in the UK- at least in my city- so I used the only brand of gelatin dessert carried by my supermarket- Hartley's. This comes as partially-constituted, very firm gelatin cubes which need to be full rehydrated by adding boiling water and cold water. I don't know what the benefit of this is as opposed to the powdered type you can find stateside as they both seem to be full of preservatives, take up the same space on a shelf, and come in similar-sized packages, but it seems to be the only way it's found here, and this is the first time I've worked with it. It's weird, but not any weirder than the powdered version I'm (marginally) used to. 5 spoons out of five. This cake is both fresh and satisfying, and it tastes like the kind of thing your grandmother would have made if your grandmother was anything like mine. It's the kind of thing you want to dig into a slice of after a light springtime dinner... or maybe for breakfast, I won't tell. Cake recipe adapted from smittenkitchen.com, where I found a reliable, from-scratch yellow cake recipe to use as my jumping point. Add boiling water to jelly, stir well and set aside. Grease 2 cake pans, then line bottoms with parchment paper. Sift together flour, cornstarch, baking powder, baking soda and salt, then set aside. Add lemon juice, vinegar or yogurt to milk and set aside. Beat butter and sugar until pale and fluffy, then add vanilla and mix to combine. At low speed, stir in milk mixture, jelly mixture and muddled berries with their juices until just combined (mixture will look curdled). Spread batter evenly in cake pan, then rap pan on counter several times to eliminate air bubbles. Bake until a wooden pick inserted in center comes out very slightly sticky, 35 to 45 minutes. Cool in pan 5 minutes, then remove from pan and allow to cool completely before frosting. Cream butter and powdered sugar until light coloured and slightly fluffy. Beat in berries and mix until light and fluffy. Frost between layers and on top cake, using additional strawberries for garnish as desired.